This blog is now located at http://fwbo-jobs.blogspot.com/. windhorse:evolution are the FWBO's largest and most successful Right livelihood business. 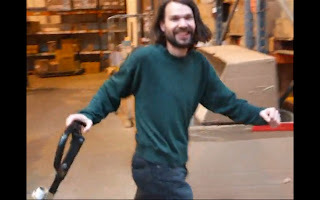 They are interested in recruiting Buddhists to work in their warehouse, in Cambridge UK, at various times of the year. Please contact dharmasiddhi@windhorse.biz for more information. 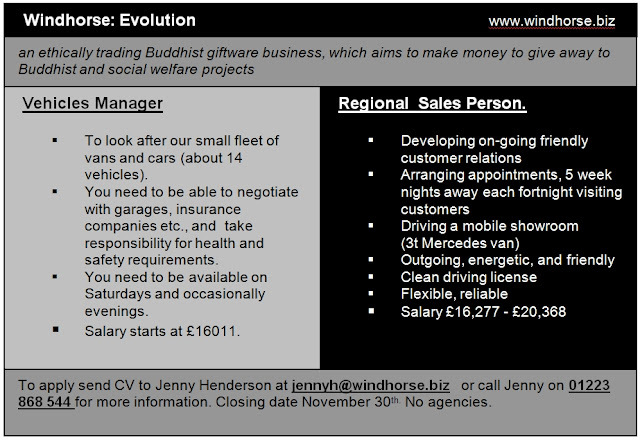 Windhorse Trading's Regional Sales team has an opening for a Sales Person, man or woman. Based in Cambridge UK, Windhorse is the FWBO's largest Right Livelihood business with over 200 staff. 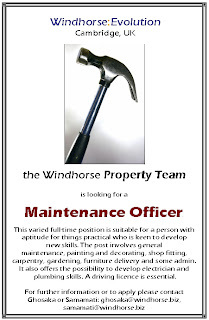 If you might be interested in being considered for this post please email Jenny Henderson (jennyh@windhorse.biz) with your CV. Windhorse: Evolution was built on an altruistic vision and continues to exist for purely generous and ethical reasons. Profits are given away to support Triratna Buddhist Order projects and social projects in the communities where our suppliers are based. We see ourselves as contributing to building a Buddhist movement for the benefit of the world and creating a very happy and human work place for the benefit of individuals. "Would you like to live a truly meaningful and memorable year as part of a Karuna Men's Fundraising Community? "On 29 September 2006, in Khairlanji village, central India, Surekha Bhotmange, her daughter Priyanka and her two sons, Roshan and Sudhir were dragged from their home by a mob, stripped naked, paraded through their village, beaten to death, and their bodied dumped in a nearby canal. Bhaiyyalal Bhotmange, the father of the family (photo opposite), escaped by lucky chance. The details of this caste-based crime are sickening, and the hatred behind it is difficult to comprehend but the viciousness is typical of many crimes committed against lower caste people in India every day. "Most of these crimes are invisible, but this atrocity came to light through Dalit campaigns and became an international news story. The Manuski project, led by members of TBMSG (the Indian equivalent of the FWBO), and supported by Karuna, played an important part in making that happen. "Could you tell Bhaiyyalal’s story? 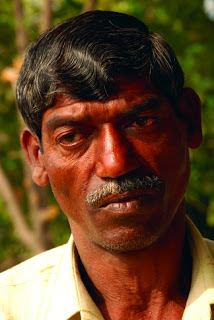 You could give Dalit people such as Bhaiyyalal a voice and help them escape the suffering caused by caste discrimination. "From September 2010 to August 2011, Karuna will be pioneering the first team of Karuna Appeal fundraisers who will come together for a year to live and work together as a community of fundraisers. "We need a team of four or more men. "EcoDharma is a Buddhist based community living in a remote valley in the Catalan Pyrenees. The wild beauty is incredible as are the ideas talked about over supper! The influences on the centre’s philosophy include radical ecology, The Work that Reconnects, engaged Buddhism, systems theory and holistic experiential learning. “You need to be over 50 (yes we know that’s a bit strange but that is what the funding is for!) and reasonably fit. Living as part of the community, you will be involved in the garden and building projects. If you know a bit about permaculture, building or capentry, food preserving - this might particularly suit you. Get in touch with Maitrisara - maitrisara@tiscali.co.uk if you want to know more about it and are interested. The retreat centre is just visible as the tiny white dot on the plateau in the centre-left of the photograph. "Is there anyone out there interested in talking to me, Mumukshu, about starting a new right livelihood venture in Devon? "We are getting very enthusiastic about the idea of opening an organic vegan/vegetarian cafe, combined with a meditation/yoga/meeting space, in our local town. It would be an interface between the local community and our local buddhafield projects, such as home-grown organic produce, the tree nursery, herbal remedies. There are keen volunteers around, supported core team members and possibly others available full time all very interested in getting involved. "However we need someone with experience, looking for something to get their teeth into and help get it off the ground. Ideally we would like a Dharmacharini, and it need not necessarily be for ever! Please call me on 07775694619 or 01363 772939 to discuss - or email mumukshu@buddhafield.com. 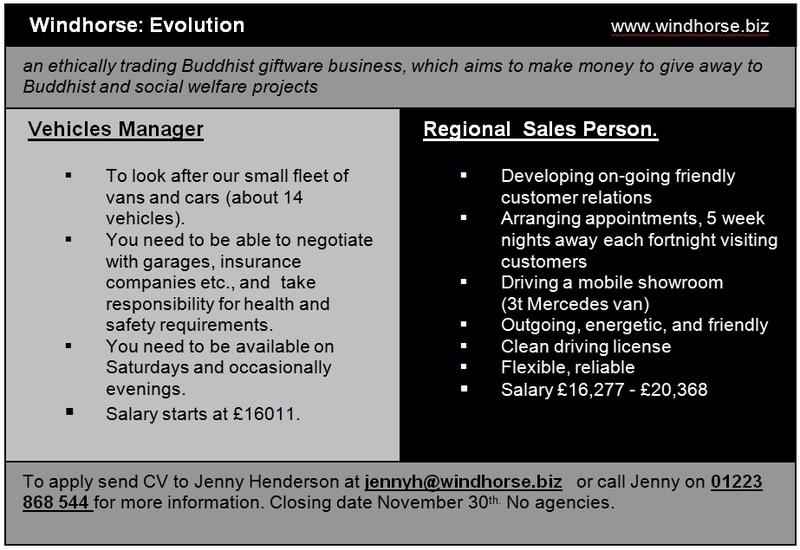 Windhorse:Evolution are the FWBO's largest and most successful Right Livelihood business, with over 100 staff based in Cambridge UK. And here's a chance to join them! 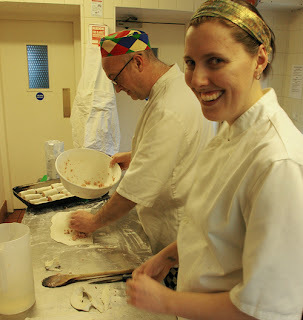 We have a vacancy on our full time residential team for a Kitchen Manager. As Kitchen Manager you will be responsible for managing all aspects of the kitchens, food store and food ordering. You will manage, develop and train a pool of volunteer cooks and be responsible of maintaining kitchen standards according to Cook Safe. You will maintain food quality standards in the kitchen, and of course cook! You will be expected to be confident cooking for up to about 30, for a week at a time. The Kitchen Manager is also expected to provide cover and support for the Housekeeper, particularly on changeover days (normally Fridays). Dhanakosa is situated in the southern part of the Scottish Highlands on the banks of Loch Voil in the Loch Lomond and the Trossachs National Park. It is one and a half hours by car from Glasgow and Edinburgh. See our web site www.dhanakosa.com for more information about us. Dhanakosa offers a comprehensive support package, as well as the opportunity to live, work and practice in the outstandingly beautiful environment of Balquhidder Glen. You will also be living and working as part of a community with a clear commitment to making work an effective spiritual practice. Applications are invited from both men and women. We are particularly interested in hearing from people with a clear commitment to developing their practice in the context of the Friends of the Western Buddhist Order. FWBO Right Livelihood Businesses, etc. Cambridge Stress Reduction: courses in mindfulness-based stress reduction taught in Cambridge. Crucible Research Finding new ways of enhancing the experience of work.